The coconut products from Dutch Plantin come from the coconut palm tree (cocos nucifera), not to be confused with the oil palm tree (elaeis guineensis). Although not nearly everyone knows the differences between these two tree species, there are clear differences. The oil palm is mass cultivated on large plantations. The largest production countries are Indonesia (6 million hectares) and Malaysia (4 million hectares). The only product obtained from the fruit of the tree (the palm stone) is palm oil, in a quantity worldwide of more than 48 million tons. The oil is used for, among other things, margarine, oil for frying, soap, biodiesel and to generate electricity. The coconut palm is mainly cultivated by local farmers in Indonesia (2.6 million hectares), the Philippines (2.3 million hectares) and India (1.9 million hectares). Due to the relatively small scale of cultivation and the involvement of the local population, this activity forms an intrinsic part of these societies. Numerous products are produced from the coconuts which grow on the trees – coconut milk, coconut oil (worldwide 3.3 million tons), coconut fibres (for rope, mats, brushes and mattresses) and cocopeat. Our coir pith is therefore essentially a by-product from the traditional fibre industry in Asia. Although the coconut palm is often cultivated locally and as a tradition, that does not mean that the cocopeat can only be produced in limited amounts. On the contrary. In 2001, Dutch Plantin carried out research in order to determine the potential annual production of cocopeat. We concluded that you could calculate that as follows: on 1 hectare of ground for cultivation, there is room for 150 coconut palms, which produce approximately 75 coconuts each per year. 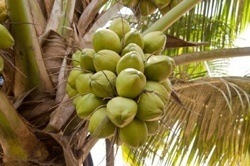 Each coconut supplies 60 grams of dry cocopeat per year. If we apply this formula to the number of hectares of ground on which coconut trees are now being cultivated, it appears that the annual production capacity lies at more than 60 million tons. This enormous production capacity applies year in, year out, because coconuts are a virtually inexhaustible source. That is due to the short cycles: the time between two harvests is one year at the most. That is a great advantage in comparison to traditional raw materials for potting soil, such as peat (which needs millions of years in order to develop). Coir pith will never be exhausted; it is therefore an extremely sustainable product.